Next up we’ve got David J. Williams, author of BURNING SKIES, now out from Bantam! Q: So what’s BURNING SKIES? A: The follow-up to last year’s MIRRORED HEAVENS—the second book in the Autumn Rain trilogy. Q: So I gotta read MIRRORED HEAVENS first? A: Your call. 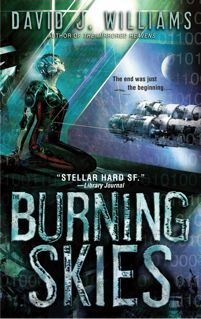 I wrote BURNING SKIES so that you can leap into the trilogy that way. The opening scene tells you pretty much all you need to know about what happened in MIRRORED HEAVENS: we’ve got rogue cyborg Claire Haskell hacking into an impregnable orbital fortress to confront her imprisoned spymaster Matthew Sinclair, and they have a Very Critical Conversation Which Covers a Lot of Ground. So even if you *did* read MIRRORED HEAVENS, you’ll learn a lot more about what was *really* going on in that book. Q: So tell me what goes down in BURNING SKIES . . .
A: BURNING SKIES centers on the Europa Platform, an O’Neill cylinder, and the site of the secret summit conference between the U.S. president and the leadership of the Eastern superpower. Naturally, the elite terrorist group Autumn Rain crash the party, and Claire Haskell is the only one that can stop them. . .
Q: Back up a sec. What’s an O’Neill cylinder? A: A massive space station—a rotating cylinder more than thirty kilometers long, and several kilometers across, with three “valleys”; you can stand in one valley and look at the other two inverted overhead. Gibson had one in NEUROMANCER, but it’s hard to find pictures of the darn things that don’t date all the way back to the 1970s. I’ve got a bunch of new art on my website; my O’Neill cylinders also have giant asteroids stapled onto their south poles, just to make the topography extra tasty. Q: Did you have a particular strategy for writing about the U.S. president? A: I wanted to approach Andrew Harrison like a historian would—to try to provide a balanced view of the man who ends up ruling the United States as a military dictator in the year 2110. Too often, it seems that authors use their fictional presidents as a reflection of their own politics—Larry Niven’s FOOTFALL has the Cowardly Liberal President; the Judge Dredd universe has the Evil Right-Wing Warmonger, etc. Incidentally, Harrison made it onto io9′s recent list of “future presidents”. . . the highlight of my career so far. . .
Q: I hear there’s a lot of F-words in these books. A: Let’s just say I’m unlikely to get onto the shelves at Walmart anytime soon. Maybe I shoulda done what Norman Mailer did in THE NAKED AND THE DEAD, and just replaced them with the word “fug” . . .
Q: I also heard that you’ve given the third book to your cat to write. Is this true? A: The last book in the trilogy is THE MACHINERY OF LIGHT, and Spartacus the Cat has been granted a week’s extension due to his catnip habit. If a million monkeys will eventually type HAMLET, I figure 10 more days should suffice for Spartacus to come up with a shattering conclusion to this trilogy, which hits bookstores next year. Q: Spartacus, do you share Dave’s confidence? BURNING SKIES is available now at Amazon and other fine bookstores! Filed under announcements, our authors, publicity and promotion. You can also use to trackback.